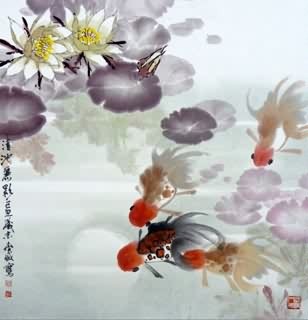 Goldfish's appearance and name are very auspicious, so there are many Chinese goldfish painting scrolls that have very good "Fengshui" meaning. 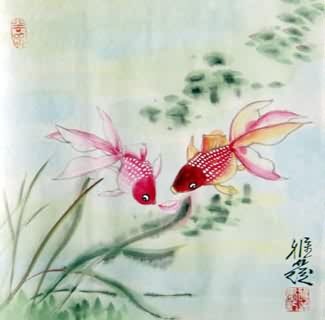 Chinese Goldfish Painting: means "Treasures fill the home" as "goldfish(金鱼)" sounds the same as that of the word "gold and jade(金玉)" in Chinese. 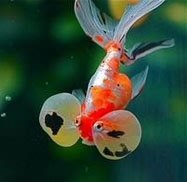 Besides, "goldfish(金鱼)" and "gold and surplus(金 余)" are homonymic words in Chinese (both sound "jin yu"), so it also has the meaning of "a large amount of money and affluence". 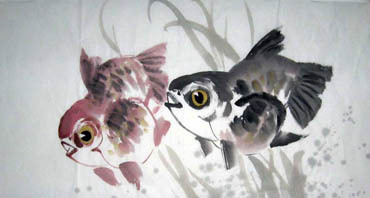 Three(3) Goldfish Fengshui Painting: represents good luck and an auspicious beginning of a new year. 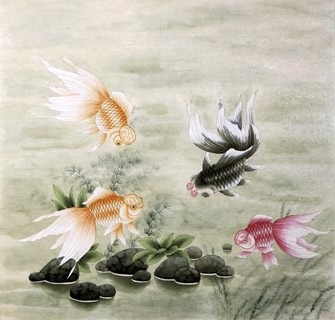 Four(4) Goldfish Painting: in China four represents the four seasons of the years. 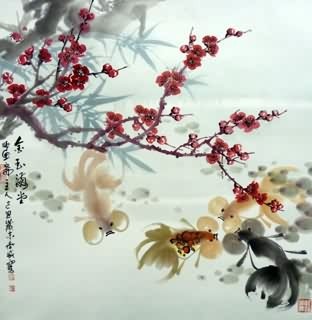 This image symbolizes affluence and fortune in the whole year. 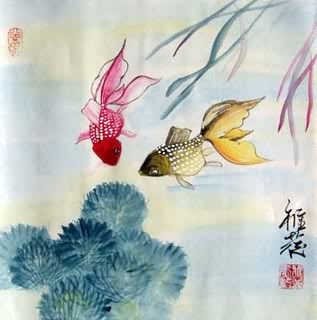 Six(6) Goldfish Painting: "Six(六)" - ("66大顺") "smooth going(business)" and "everything goes well". 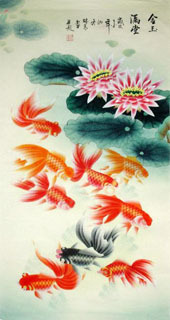 Six goldfish picture symbolizes "may you make a lot of money successfully". 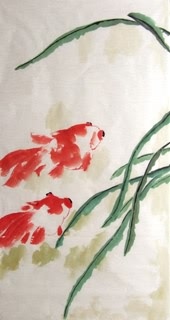 Nine(9) Goldfish Painting: "nine(九)" - "permanence(久)". 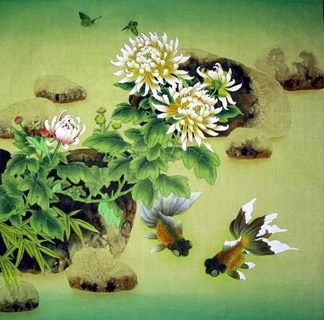 Symbolizes "a large amount of money and affluence lasting for a long long time". 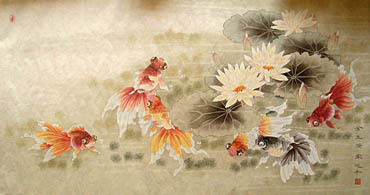 More Goldfishes or One-hundred Goldfish Painting: as there are many goldfishes drawed in the painting, so it symbolizes gathering wealth together. 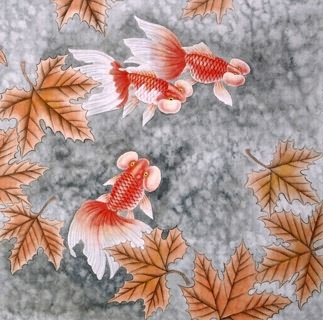 If you put goldfish painting in your hall, it can bring you weath, good luck, riches and honour. 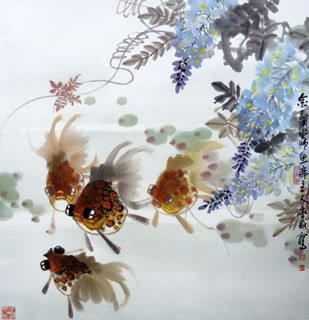 It's also good to hang goldfish painting in your office, it can help you get a successful business and a large amount of money. 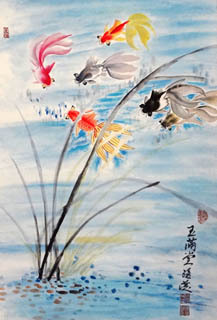 InkDance Price: USD 325 /GBP 267 /EUR 309 Sold, you can customize it. InkDance Price: USD 428 /GBP 351 /EUR 407 Sold, you can customize it. InkDance Price: USD 3880 /GBP 3182 /EUR 3686 Sold, you can customize it. InkDance Price: USD 482 /GBP 396 /EUR 458 Sold, you can customize it. InkDance Price: USD 408 /GBP 335 /EUR 388 Sold, you can customize it.